Home » Sports » Harrison pitches 6 scoreless innings! 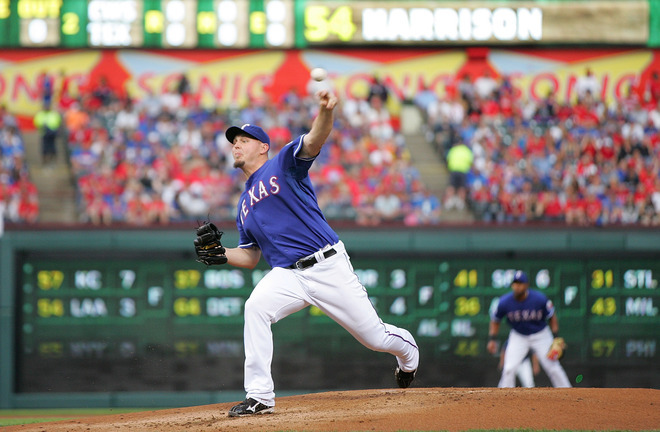 Matt Harrison pitched six scoreless innings while Josh Hamilton, Adrian Beltre and David Murphy homered for the Texas Rangers, who wrapped up their season-opening series with a 5-0 victory over the Chicago White Sox on Sunday night. Hamilton’s first homer of the season was a 441-foot blast that landed in the second deck of seats high above the Rangers bullpen in right-center field. That was leading off the sixth against Gavin Floyd (0-1), putting Texas up 4-0 right after Harrison threw his last pitch. Harrison (1-0) worked out of a jam in the top of the sixth when A.J. Pierzynski struck out with two runners on base. The left-hander was barely settled down on the bench after that when Hamilton crushed an 0-1 pitch. Harrison jumped up and watched in awe with several teammates as the ball kept rising and landed several rows deep. Murphy led off the third when he pulled a ball into that second deck as well, closer to the line for a 396-foot shot. Hamilton opened the fourth with a single before Beltre’s two-run shot landed in the Rangers bullpen. Hamilton also had a pair of nifty ending-inning defensive plays. The center fielder made a diving catch in the left-center gap on a slicing flyball hit by Alejandro De Aza in the seventh. He ended the second when he reached out on the run to stab a liner by Pierzynski in the right-center gap before tumbling to the ground. Harrison, a 14-game winner last season who had a 1.69 ERA in four Cactus League starts this spring, struck out three and walked two while giving up four hits. Mark Lowe, Robbie Ross and Koji Uehara each worked a scoreless inning of relief. Floyd, 0-3 in his final five starts last season, struck out three and walked two. He allowed only one earned run over 14 innings in two games last year against the Rangers, who this time got five runs (four earned) in 5 2-3 innings against the right-hander. The two-time defending AL champions took two of three in the weekend series against Chicago, which played its first games under new manager Robin Ventura. The White Sox have three games in Cleveland before their home opener Friday against Detroit. Texas opens a four-game series at home Monday night against AL West rival Seattle with 25-year-old Yu Darvish making his much-anticipated major league debut. The right-hander, who signed a five-year deal with the Rangers this winter, was 93-38 with a 1.99 ERA in 167 games the past seven seasons in Japan’s Pacific League.